Capcom's really gone all out with this. Monster Hunter: World's latest free update adds a new crossover event to the game, welcoming The Witcher 3: Wild Hunt protagonist Geralt of Rivia to the fray. As soon as you start this quest up, you know something's different. 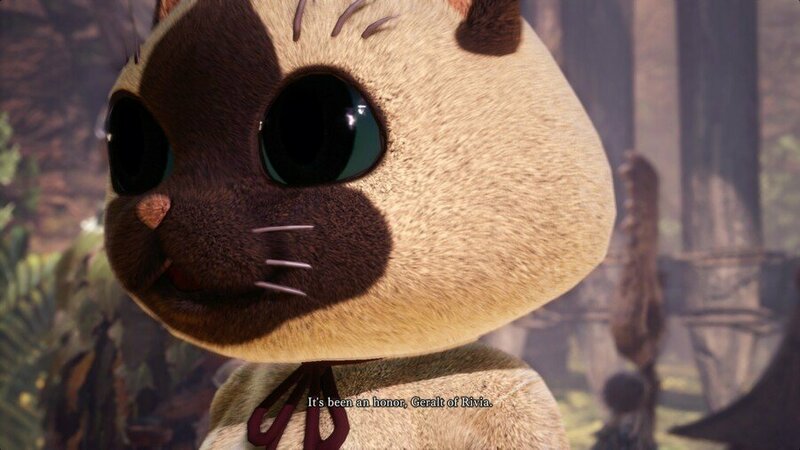 There's more dialogue, like Monster Hunter suddenly has a story worth caring about. Then the man himself appears. Geralt's thrown out of a portal and proceeds to talk to you and your hunter buddies about the situation. He's been teleported to the world of Monster Hunter and he needs to figure out why. As it happens, the hunters talk of strange goings on in the Ancient Forest -- the game's lush first area -- and guess what? Geralt decides that he's going to go and take a look. "Oh, sweet, we get to help good old Gerry with his mission," we thought. But that's not quite what happens. Spoilers for the quest are below -- read at your own risk! No, you don't get to help Geralt out -- you get to play as Geralt. In Monster Hunter. You investigate footprints, you talk to people, gather information -- you even have dialogue options. As the headline of this article suggests, the whole thing is amazing. At first we couldn't quite believe what we were playing. 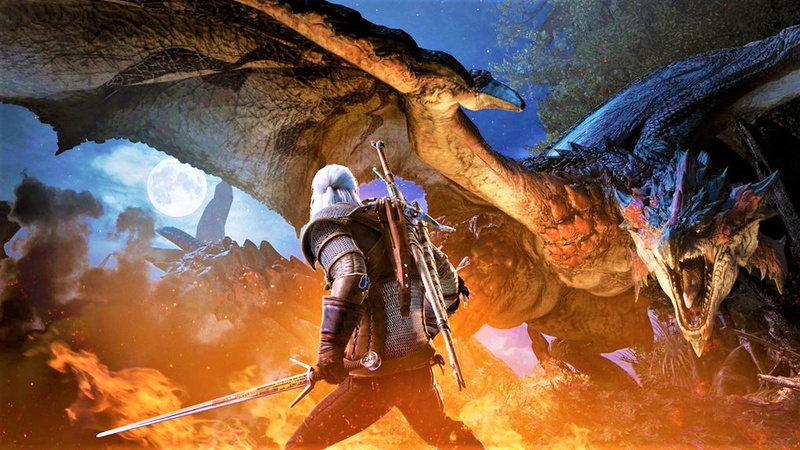 Capcom's literally taken whole parts of The Witcher 3 and bolted them onto Monster Hunter. Quest names pop up on screen, just like they do in Wild Hunt. Geralt has specific dialogue for certain actions, like mining and gathering plants. He'll comment on how these strange materials could be useful in his alchemy. It's bizarre in the best way possible. Do enough investigating and Geralt's fears are realised. A Leshen, a powerful monster from his own world, has travelled to this one, bringing Geralt with it. It's drawing power from the bountiful plant life of the forest, and it needs to be stopped. And yes, you do fight it. It's an entirely new monster, specially made for this event. It's got all of the abilities and attacks that Witcher 3 players will know, but it's still a tricky encounter. Geralt himself can be equipped with any of World's weapon types, but we decided to stick with his twin swords, which utilise Monster Hunter's sword and shield moveset. Impressively, the animations have been altered to make it seem as though Geralt is using his Witcher signs -- the versatile magic skills that help him fight beasts of all shapes and sizes. Bring down the Leshen and you're greeted with another cutscene as Geralt says goodbye to his new hunter pals, but even by this point, it still seems surreal. He gifts your hero a runestone, which you can use to cast the fiery Igni sign whenever you like, and then he goes off in search of a portal back to his own world. What a lovely touch. 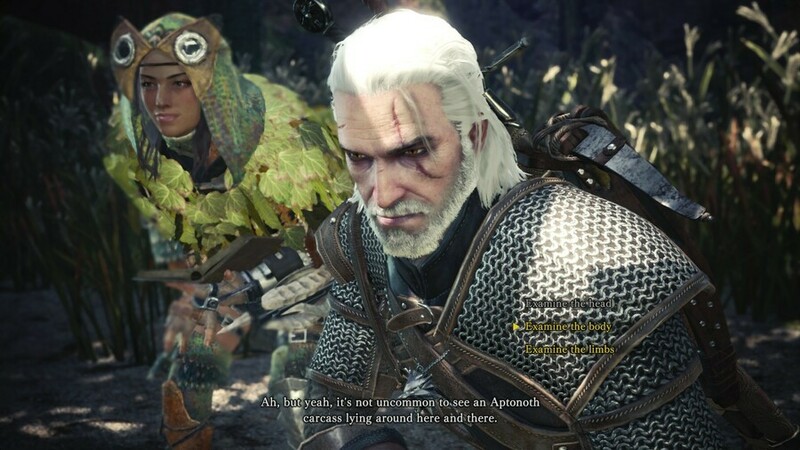 Again, it may only be one quest, but it's crazy how far Capcom and CD Projekt Red have taken this. For a totally free update, it's seriously impressive, and really punctuates the superb job Capcom has done in providing post-launch support for Monster Hunter: World. Playing as Geralt in Monster Hunter, man. It's going to take us a while to get over this one. Have you tried this latest event for yourself? Sharpen your silver blade in the comments section below. Great article, I love stuff like this! Mad props to Capcom for doing something like this for FREE. It's fair to say Capcom are absolutely crushing it right now. I'll be trying this out over the weekend. I remember the 'woodland spirit' Leshen in The Witcher 3 always used to terrify me. Scary buggers the way they just slowly roam through the trees. @get2sammyb is this a timed event or will it be available afterwards as well? @Bingoboyop You'll need to ask @ShogunRok! No idea, I'm afraid! @Bingoboyop I believe it's available forever from this point on, like the Final Fantasy quests. @ApostateMage I remember the first time I played TW3, and I was low level just exploring the world. I stumbled across that forest where a non-contract Leshen lives, and it was incredibly ominous. I hadn't fought or seen one yet, and I could just make it out slowly lurching in the distance, making those weird noises. What a game! Wish the whole game were designed like this; then I'd be more interested in playing it. The demo left me rather bored. 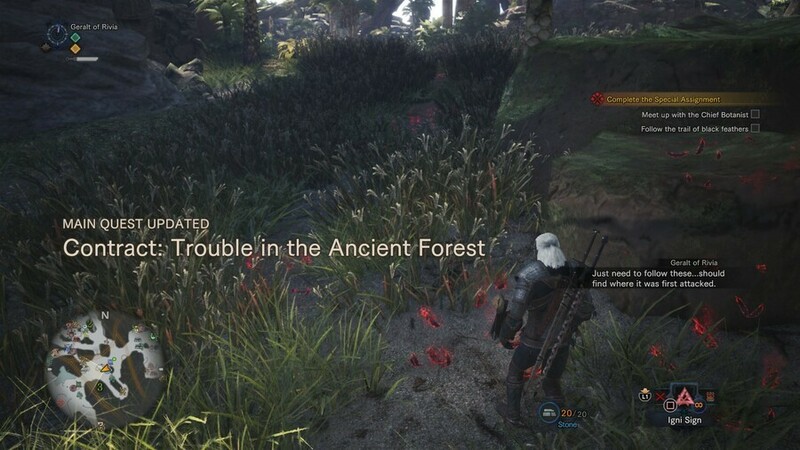 I haven't played Witcher 3 but enjoyed this new quest and monster. Kudos to Capcom! This is really awesome advertising too. Think about having a movie character or something similar be in a video game as free DLC. @ShogunRok Indeed. It's still the best game this gen for me. Seems that next week we're getting another quest where we get to use our hunter to kill a bigger/stronger version of the Lesher. Seems we can also forge Geralt's and Ciri's armor, but so far I have no idea how to do it. 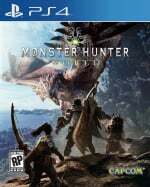 @doctommaso , if you were bored by the MHW demo, then you may not understand MH or it may just not be for you. As a game, it has little to nothing to do with story and everything to do with gameplay that rewards you for learning the mechanics and monsters and taking advantage of that. All the fun, excitement, and satisfaction in the game comes from learning the monsters' moves and patterns and besting your previous performances against them by exploiting that hard-earned knowledge. Nothing beats the feeling of nailing a mon right in the head with a charged great sword as it turns to face you, because you know exactly what it's doing and when it's going to do it. This kind of experience, where you feel yourself becoming better at the game with each battle, learning and understanding every detail about a monster and you weapon, is absolutely infectious if you're into it. It is what has kept people playing these games for thousands of hours per outing for over a decade. @Athrum the Witcher SnS and the Geralt full armor set can be crafted using the Leshen's materials at the smithy. Ciri armor and DBs are apparently coming next week. @Mikethemosher It's likely here to stay same as the Behemoth quests have been, so no rush. You have to be at endgame to even do this Witcher stuff, however, so you'd have a road ahead of you even if you started today. @AllHailQueenBoo Yeah I don't know why, but it just didn't do anything for me. I'm largely a gameplay only guy, too — for example, I consider the Souls level of storytelling to be preferable over long drawn out cutscenes and endless sidequests (things that made the Witcher at times hard to bear, in fact). Soul Calibur, Monster Hunter - I'm loving all the cameos Geralt is making at the moment. Crash Team Racing next please. @Gremio108 they should just make Witcher karting with the whole gang. Geralt could use his signs, the sorceress’s magic spells and Roach could be really fast but screech to a halt at every bridge. So good.... It kinda blew my mind playing.